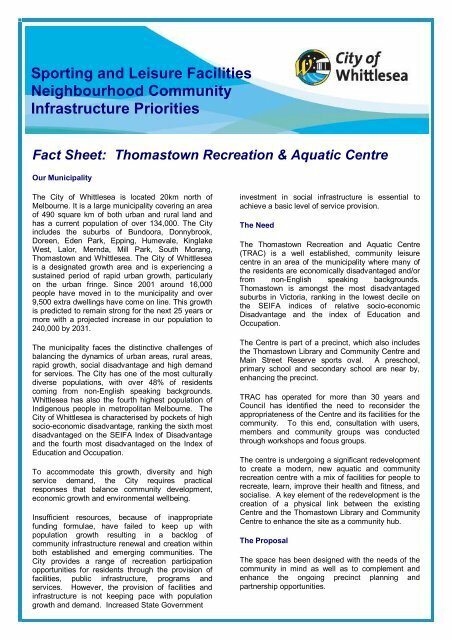 Sporting and Leisure FacilitiesNeighbourhood CommunityInfrastructure PrioritiesFact Sheet: Thomastown Recreation & Aquatic CentreOur MunicipalityThe City of Whittlesea is located 20km north ofMelbourne. It is a large municipality covering an areaof 490 square km of both urban and rural land andhas a current population of over 134,000.  The Cityincludes the suburbs of Bundoora, Donnybrook,Doreen, Eden Park, Epping, Humevale, KinglakeWest, Lalor, Mernda, Mill Park, South Morang,Thomastown and Whittlesea. The City of Whittleseais a designated growth area and is experiencing asustained period of rapid urban growth, particularlyon the urban fringe. Since 2001 around 16,000people have moved in to the municipality and over9,500 extra dwellings have come on line. This growthis predicted to remain strong for the next 25 years ormore with a projected increase in our population to240,000 by 2031.The municipality faces the distinctive challenges ofbalancing the dynamics of urban areas, rural areas,rapid growth, social disadvantage and high demandfor services. The City has one of the most culturallydiverse populations, with over 48% of residentscoming from non-English speaking backgrounds.Whittlesea has also the fourth highest population ofIndigenous people in metropolitan Melbourne. TheCity of Whittlesea is characterised by pockets of highsocio-economic disadvantage, ranking the sixth mostdisadvantaged on the SEIFA Index of Disadvantageand the fourth most disadvantaged on the Index ofEducation and Occupation.To accommodate this growth, diversity and highservice demand, the City requires practicalresponses that balance community development,economic growth and environmental wellbeing.Insufficient resources, because of inappropriatefunding formulae, have failed to keep up withpopulation growth resulting in a backlog ofcommunity infrastructure renewal and creation withinboth established and emerging communities. TheCity provides a range of recreation participationopportunities for residents through the provision offacilities, public infrastructure, programs andservices. However, the provision of facilities andinfrastructure is not keeping pace with populationgrowth and demand. Increased State Governmentinvestment in social infrastructure is essential toachieve a basic level of service provision.The NeedThe Thomastown Recreation and Aquatic Centre(TRAC) is a well established, community leisurecentre in an area of the municipality where many ofthe residents are economically disadvantaged and/orfrom non-English speaking backgrounds.Thomastown is amongst the most disadvantagedsuburbs in Victoria, ranking in the lowest decile onthe SEIFA indices of relative socio-economicDisadvantage and the index of Education andOccupation.The Centre is part of a precinct, which also includesthe Thomastown Library and Community Centre andMain Street Reserve sports oval. A preschool,primary school and secondary school are near by,enhancing the precinct.TRAC has operated for more than 30 years andCouncil has identified the need to reconsider theappropriateness of the Centre and its facilities for thecommunity. To this end, consultation with users,members and community groups was conductedthrough workshops and focus groups.The centre is undergoing a significant redevelopmentto create a modern, new aquatic and communityrecreation centre with a mix of facilities for people torecreate, learn, improve their health and fitness, andsocialise. A key element of the redevelopment is thecreation of a physical link between the existingCentre and the Thomastown Library and CommunityCentre to enhance the site as a community hub.The ProposalThe space has been designed with the needs of thecommunity in mind as well as to complement andenhance the ongoing precinct planning andpartnership opportunities.